The Bosch GAS18 V-3N 18 V Cordless Wet/Dry Vacuum Cleaner is a convenient solution for cleanup just about anywhere, including shop, jobsite and truck. Working with the Bosch 18 V power system, this cordless vac is built to complete cleanup or emptying chores. 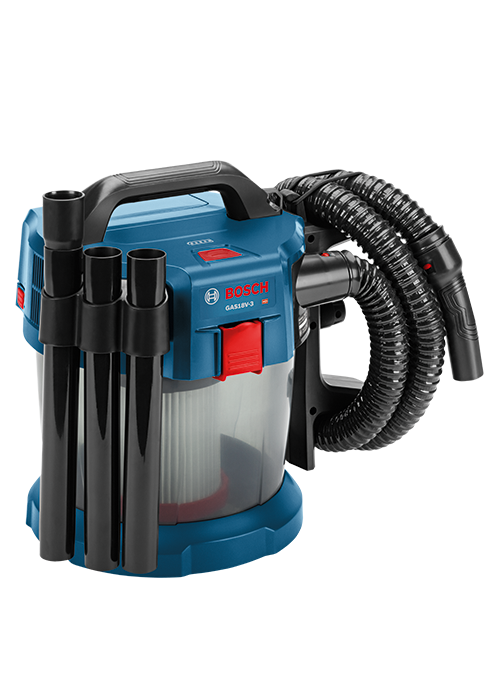 With 24 minutes of high-power vacuuming using a Bosch 18 V 6.0 Ah battery, it provides sustained performance with long runtime. This wet/dry vacuum features rotational airflow technology for sustained suction. It delivers up to 51 CFM of airflow. Portable, handy and powerful, this vac weighs 10.2 Lbs. (tool with attachments only, not including battery). It features a washable HEPA filter, which captures 99.97% of particles at 0.3 microns and larger. The cordless wet/dry vacuum features a complete set of attachments. The vacuum cleaner includes a washable HEPA filter, which captures 99.97% of particles at 0.3 microns and larger. The vac also features a complete set of attachments, including three extension tubes, a crevice nozzle and a floor nozzle. When used with the optional Bosch VX120 vacuum hose adapter (sold separately), this vac can be connected with many Bosch power tools and attachments that have dust-collection ports.This is a bare-tool kit; the battery and charger are sold separately.